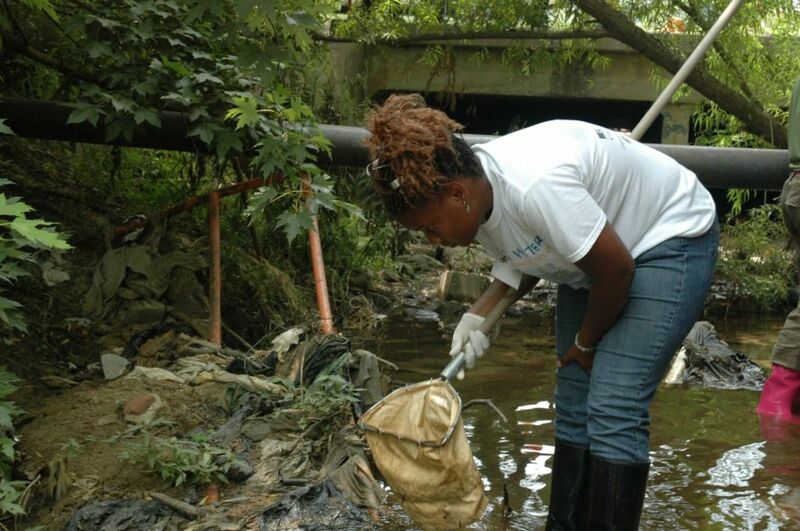 With its roots in community struggle for environmental justice, the West Atlanta Watershed Alliance (WAWA has grown into a dynamic watershed education, advocacy and stewardship organization. WAWA arose from community efforts to halt discriminatory waste water treatment practices in West Atlanta, and since 1995 has been working in partnership with members of the West Atlanta community to protect green space and water quality in West Atlanta while educating residents about important environmental issues that affect their communities. WAWA engages people from all walks of life in educational and service activities that build community investment in the watershed. Located five miles from downtown Atlanta, WAWA’s Outdoor Activity Center is the center of its youth environmental education activities. The Bush Mountain Outdoor Activity Center is a 26-acre nature preserve that includes 2 miles of trails, as well as a team-building ropes course, and a children’s nature-themed playground. Among the learning facilities are a tree house classroom, a 650-gallon freshwater aquarium, and a multi-purpose building. Adjacent to the facility is a unique sustainable urban farming system, Bioponica. WAWA’s community engagement activities include those that connect children, families and adults with healthy outdoor activities like the Great American Backyard Camp Out – an annual overnight tent camping activity that encourages urban Atlanta residents to create their own camping experiences and to develop a positive and lasting connection with nature. To support the science education needs of underserved and/or underrepresented middle schools, WAWA helps run the Watershed Education Stewards Training Project (WEST), part of a statewide network of environmental science field laboratories on existing public, private and state lands. To engage adult community members, WAWA runs practical green infrastructure education programs, providing hands-on training on how to prevent erosion, stormwater runoff and pollutants from entering streams through education and on-site assistance assembling rain barrels. Workshop participants take home assembled rain barrels and kits to connect them with gutter downspouts.